PROBLEM: Distributor head not level causing pins to feed into bins improperly, causing pin jams. REMEDY: When installed the "Tuffy" Dist Head Leveler will keep the distributor head level maintaining proper pin feed. 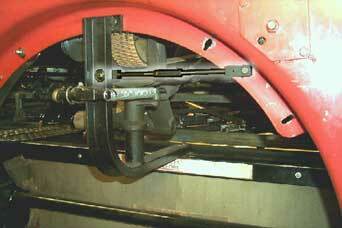 Another benefit of the Head Leveler is that it will stabilize the distributor support bracket. INSTALLATION & ADJUSTMENT: Installs in less than 15 minutes and adjustment is made with a turnbuckle.